I will be helping to run the IBM stand at the Young Scientist exhibition tomorrow and so I decided to drop in for a quick visit this morning to check how things are going. I have been to this event many times and so I should have know what to expect, but once again I was blown away by the energy and excitement of this event. I had a very quick look at the projects and, one project which caught my eye was "Cycle helmet with built-in sensor controlled indicators", which was the work of a second year student in Gonzaga College. 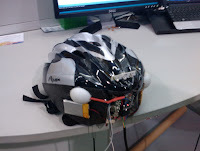 This project involved adding some sensors and an Arduino micro-controller to a cycle helmet so that the helmet could automatically detect when the cyclist was going to turn left or right (by the inevitable tilting of their head) and automatically turn on the indicator lights. In addition the helmet included a gyroscope which was used to detect when the turn was completed and the indicator lights should be turned off. The final touch was the addition of an accelerometer whick controlled the braking light. I think that this is a really useful gadget which I would use (unfortunately he is not in a position to accept advance order yet), but what really impressed me was how such a young student was clearly very well informed about the technology scene. When he found out that I knew about Arduino devices he immediately launched into a discussion about the limitations of the USB interface on the board (the quick summary is that it doesn't quite match the formal interface specification). He also gave me pointed to some web sites for buying components and advised me on how to tackle a project I am planning with my recently acquired weather station. DISCLAIMER: I did not get a chance to see all of the projects (or even a small proportion of them) so there may be many better projects - I will await the results of the formal judging which will be announced this evening.